Not only was I nominated for Charleston City Paper's "Best Realtor", but our brokerage was nominated for "Best Realty Company" as well! This would not have been possible without all of your nominations for us in the first round of voting! The final voting round is officially open, and will end on Tuesday, March 5th. 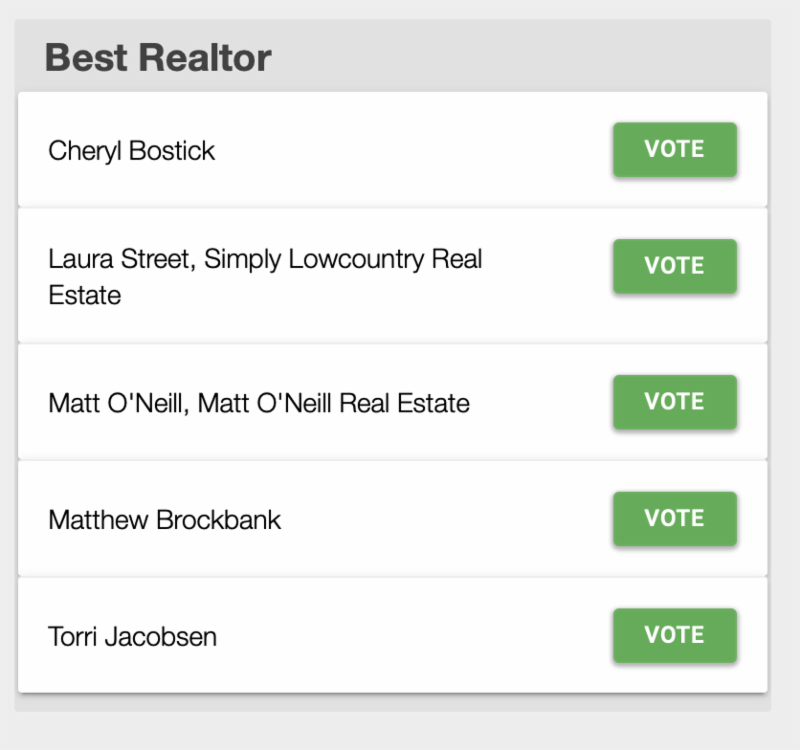 If everyone could take one minute to head over to the Best of Charleston nomination site and click the green vote button next to "Laura Street, Simply Lowcountry Real Estate" for Best Realtor and, "Simply Lowcountry Real Estate" for Best Realty Company we'd be forever grateful! 2. Scroll down until you see Best Realtor (categories are in alphabetical order). CLICK THE GREEN VOTE BUTTON next to "Laura Street, Simply Lowcountry Real Estate". 3. Click Submit after you have entered your first name, last name, postal code and email address! 4. 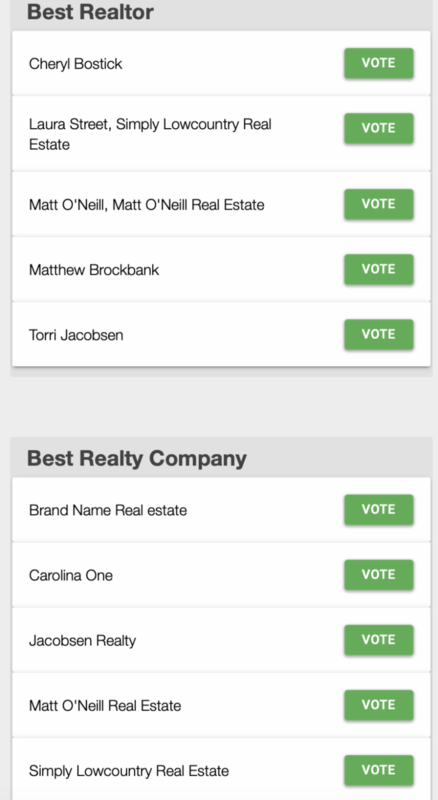 Then, scroll down one more box to Best Realty Company, and click the green vote button next to "Simply Lowcountry Real Estate". This year, Laura will receive the prestigious REALTORS® of Distinction award, presented in March. Last year, Laura personally closed over $9.5 million in real estate transactions, ranking her in the top 10% of local realtors, and placing her in the Silver Circle for the Realtor of Distinction award with the Charleston Trident Association of Realtors. The brokerage, Simply Lowcountry Real Estate, closed over $15 million in transactions in 2018. Laura was also nominated as a finalist by popular vote for “Best Realtor in Charleston" for the second year in a row by the Charleston City Paper for their annual “Best of Charleston” contest. Her real estate brokerage, Simply Lowcountry Real Estate, was also nominated as finalist in the “Best Realty Company” category as well for the City Paper’s Best of 2019 contest. Our favorite reasons for relocating to Charleston, SC. 3. No snow! Ok, it has snowed once or twice. 4. Amazing food. This is called Shrimp and Grits. You would have to move here to understand. 5. Direct flights to a lot of nice places including back home. Just in case you missed the feeling of a crowded subway. 6. Unlike Florida, we have real seasons. It’s a chilly 55 degrees in this picture! 7. There are other people from the North already here. Remember, direct flights! 10. Boeing, Google, Amazon, and Volvo are already here waiting on you. Our review of the North Mount Pleasant Real Estate Market in 2018. Yesterday we attended the 2018 Year End Market Review hosted by the Charleston Trident Association of Realtors at Trident Technical College. The event was well attended hosting over 850 Realtors. The events main speaker, Dr Joseph Von Nessen, an economist with the University of South Carolina, spoke about an “economic tug of war” that existed at the end of 2018 and continues into the beginning of 2019. The tug of war is between the positive indicators of wages and job growth with the negative impacts associated with the government shutdown, a global slowdown, and a trade war with China. The outcome of this tug of war—especially the expected outcome in early March of the trade agreement with China—will be a determining factor for our state economy that relies heavily on manufacturing and exports. The South Carolina unemployment rate is currently at 3.3% which is less than the national average of 3.9%. Dr. Von Nessen pointed to this data as potentially temporary economic indicators. He noted that we are currently in the 10th year of the longest economic expansion since World War II. If we continue along our current trendline, Dr Von Nessen predicts that the Dow jones industrial average will reach 30,000 by 2023. Dr Von Nessen and Lawrence Yun have encouraged their audience to look at economic data over the long run, instead of focusing on short term volatility. Despite the uncertainty on the national level, 2018 was still a strong year for the Charleston real estate market. We’re sharing with you below all the important info and stats from this previous year. In 2018, the Charleston Trident MLS saw 18,159 closed sales. This number is down by 1.4% from 2017’s 18,410 closed transactions. The top 5 areas in 2018 that showed the most positive change in number of closings from 2017 were: Sullivan’s Island, Johns Island, Seabrook Island, Dorchester Road Corridor and the Edisto area. The bottom 5 areas showing negative change from 2017 are: Isle of Palms, Folly Beach, Greater North Charleston, Hollywood/Ravenel/Meggett area, and lower Mount Pleasant. Inventory has been the biggest concern in the Charleston market for several years. Since 2014, the inventory has been decreasing each year, making Charleston a sellers market, all while the number of closed sales has been trending upwards. We ended 2018 with a total of 5,109 homes for sale, that is down 5% from 2017’s year-end inventory of 5,376 homes for sale. The top area for inventory change in 2018 was Hanahan, up by 28.8%, followed closely by Kiawah Island, Wando/Cainhoy, Upper Charleston Peninsula and West Ashley. 2018 reached the highest average sales price seen by the Charleston tri-county area at $360,210. 2018’s average sales price number is up by 5.9% from 2017. The top area for change in average sales price from 2017 was Kiawah Island, which increased by 21.7%. The median sales price for 2018 was $266,500, which is an increase of 6% from 2017. The average number of days on market (DOM) for a home until a sale in 2018 was down by 5.5% in 2018, making it 52 DOM. In 2017 the average DOM until sale was 5.2%. The largest change in the number of DOM in the last 4 years was seen when 2014’s average was 80, and decreased by 25% in 2016 to just 60 DOM. The area that had the greatest change in DOM was Daniel Island, which increased by 45.9%. Isle of Palms had the greatest decrease in DOM, decreasing by 22% from 2017. When a homeowner lists their home for sale they hope it’ll sell for the number they have chosen to list their house for. However, sometimes home sellers will have to reduce their price during the course of the listing. The percentage of original list price received statistic refers to the original price the home was listed at, and not what it was reduced to. On average, in 2018, home sellers received 96.6% of the original list price, this is a .1% increase from 2017’s 96.5%. At one point in time the market had many distressed sales (foreclosures, short sales, bank owned, etc. ), and each year the number of distressed properties has slowly tapered off. There are still a handful of short sales and foreclosures though that do hit the MLS, although not as many as there was one point in time. In 2018 only 4.9% of closed sales were distressed property sales, that number is down 14% from 2017. The top area for distressed market share in 2018 was Folly Beach (27.8%), followed by Hollywood/Ravenel/Meggett (10.2%), and James Island (7.5%). ****PLEASE NOTE: A property is counted as Distressed when the SPECIAL field in CTARMLS is marked as "Lender Owned," "Corp Owned" or "Possible Short Sale,", or if the POTENTIAL SHORT SALE field is marked "yes," or if the REMARKS or AGENT NOTES fields contain a phrase that 10k Research has determined will very likely mark a distressed property. The peak of new construction was in October of 2017, at the end of 2018 there were 3.9 months supply of new construction product on the market in the Charleston tri-county area. In new construction, 99.5% of the original price was received when a new home closed. The top 3 areas for new construction market share in 2018 were Johns Island (45.2%), Goose Creek/Moncks Corner (35.9%) and Wando/Cainhoy (30.1%). We’ll breakdown each specific area in separate reports over the course of the next several weeks, but to start we wanted to give you a thousand foot view of the three counties that make up the Charleston tri-county area. Charleston County had 8,990 closed sales in 2018, down by 4.9% from 2017. Of those, 17.5% were new construction, 24.6% were condos and townhomes. The average days of market was 56, with 95.9% of original list price received when a home closed. Berkeley County had 4,800 closed sales, down 1.4% from 2017. 21.1% were new construction, 17.8% were condos and townhomes. The average days on market was 44 and 97.9% of original list price was received. Dorchester County had 3,579 home sales, an increase of 3% from 2017. 20.2% were new construction, 10.5% were condos and townhomes. The average days on market was also 44, and 97.6% of original list price was received. The Charleston area as a whole had 18,159 closed sales, down 1.4% from 2017. 21.1% were new construction, 17.8% were condos/townhomes and the average days on market was 52, with 96.6% of original list price received. The area with the highest number of closed sales was Goose Creek/Moncks Corner. Goose Creek/ Moncks Corner had 3,324 closed sales, down 2.2% though from 2017, with 36.4% being new construction sales and just 10% being condos/townhomes. The second highest number of sales was recorded in the Greater Summerville area with 2,302 closed sales, up 3.4% from 2017. 19.1% were new construction, and 7% were condo/townhome sales. The area with the third highest number of sales was the West Ashley area with 1,774 closed sales, down 5.4% from 2017. 13.1% were new construction sales, and 24.2% were condo/townhomes. In 2017 these were also the 3 areas showing the most sales (in the same order). Sullivan’s Island had the least sales in the Charleston Trident MLS in 2018. Sullivan’s Island had only 64 sales, which was up 8.5% from 2017. The average days on market for this area was 77, and 93.7% of original list price was received. The second area with the least amount of sales was St. George/ Rural Dorchester County. This area showed 69 closed sales in 2018, which is down 2.8% from 2017. Average number of days on market in this area was 74, with 93.9% of original list price received. And lastly, the third area with the least number of sales was Kiawah Island with just 72 MLS sales. This however is a 10.8% increase from 2017. The average number of days on market was 176 and only 89.9% of original list price was received. Much like the numbers above in the areas with the most sales, this category has the same 3 areas from 2017. The difference in 2018 however, is that Kiawah and St. George/ Rural Dorchester County switched spots, with Kiawah showing an increase in sales. ** ALL DATA AND CHARTS/GRAPHS ARE FROM THE CHARLESTON TRIDENT MULTIPLE LISTING SERVICE. SIMPLY LOWCOUNTRY REAL ESTATE, LLC DOES NOT GUARANTEE THIS INFORMATION. Q: What exactly is a multiple offer situation? A: A multiple offer situation occurs when a listing agent has received multiple offers to purchase from buyers on the same listing. It can be 2 offers or 6, it’s hard to tell exactly how many offers a property can expect and unless the listing agent and seller choose to share the information with the Buyer agent, sometimes we won’t know how many offers are actually in the running. Q: We’ve heard sellers set a highest and best deadline, what is that? A: Not all multiple offer situations will result in a highest and best deadline. The listing agent takes direction from the seller, so if the seller chooses to set a highest and best deadline here is what happens: A highest and best deadline is an opportunity for the buyer to do exactly what it sounds like- submit their highest and best offer for the property. A buyers final offer will be due by a certain time and date and after that deadline occurs the listing agent will sit down with the seller to review offers and the seller will select the offer that is best for them. Q: So does that mean whoever offers the most for the house will have their offer accepted by the seller? A: Not necessarily. In some cases, yes. In some cases though, a seller might be more likely to choose a cash offer, an offer with no closing costs assistance, an offer not contingent on an appraisal, an offer with a very small due diligence period, or an offer that can close quickly even if that buyer has offered a little bit less in terms of price. We can’t answer this question with 100% certainty though because it’s ultimately the sellers choice and each seller has a different situation and motivation for selling their home. It’s important to note though, that these types of contingencies (or lack of) might not make for the best situation for you as a buyer and that’s where your real estate agent can lend professional opinion as well as the pros and cons of these contingencies. Q: Does a multiple offer situation mean the house will sell for more than list price? A: Not always, but a lot of times that is the case. We’ve seen situations where a home has sold for $50,000 more than list price, $1,000 more than list price and everything in-between. Each home presents a totally unique situation. A lot of times a multiple offer situation will occur when a listing first comes on the market because it’s new and everyone is just seeing it for the first time, however sometimes two or more buyers will show interest in a home that has been on the market for a little while and it just so happens that there is more than one offer. This can also occur after a price reduction on a home that has already been listed for a period of time. In these situations, sometimes a home will sell for less than the listing price even though there were multiple offers. Q: So, what do you suggest I offer? A: As much as we want to answer this, we can’t! Here’s what we tell our buyers: offer what you feel comfortable with. If you’re comfortable going over the listing price by $2,000 then great, if you’re only comfortable with a full price offer then that’s fine too. We don’t want you to regret a decision, so it’s important to make sure you evaluate the comps that your real estate agent sends to you when determining your offer price. If we find our buyers in this situation we help to explain the comps, offer guidance, help buyers to make their offer strong in other areas (closing costs, due diligence, earnest money, etc. ), and talk about pricing trends and market trends. In the end though, you, the buyer, have to be comfortable with your decision. We never want you to do something you’re not comfortable doing. Q: We’re already at the top of budget, what can we do? A: There are other ways to make your offer strong and to have it considered by a seller. If you’re a cash buyer that can be a strong position in itself, and with cash there is some additional flexibility as well (amount of time needed to close, due diligence, appraisal etc.). Again, removing some of these contingencies isn’t always the best answer though. If you’re a buyer obtaining financing, making sure you have a solid pre approval letter with a current date stating the address and that your credit has been checked, employment verified, and so on. That alone can be a huge boost and give a seller more confidence in accepting an offer contingent on financing. We can also help you to make your inspection period as short as realistically possible and we can work with your lender to talk about quick closing time frames. When we get to this situation though, we are here to help and chat more in depth about these options and whether or not they make sense for your buying position. Q: Is this happening at a certain price point? A: Honestly, it’s happening at a variety of price points. There are some price points that are hotter than others and driving more offers than another. We’ve seen multiple offers under $300,000, from $400,000-$600,000 and over $1million. If a home is priced right and there are a lot of people looking in that price range then the odds of multiple offers happening is a good bet. Q: Can we avoid this situation? A: Homes that have been on the market for a while and have not gone under contract are less likely to have multiple offer situations, but even then we still see it happen. Being the first buyer to get an appointment isn’t necessarily going to give you a leg up either. Highest and best deadlines can sometimes give several days for buyers to go and view the home and then make an offer before the seller reviews any offer on the table. If new construction is an option for you, then this could be a good route to take that we can help you with that might be less likely to have multiple offer scenarios occur. ***Always consult a real estate professional, attorney or mortgage lender prior to making any buying decision or offer. One of the things we get asked about most often when showing homes on Seabrook Island is how exactly the Seabrook Island Club works, what types of amenities the island offers and whether or not you’re required to become a member of the Club when purchasing property on the island. We have answered some of your most asked questions below in hopes that almost all of your questions will be resolved! Q: Are you required to join the Seabrook Island Club? A: Yes. Membership to the Seabrook Island Club is required when purchasing any type of property on the island. Q: Are there different types of memberships available? A: Yes, the Seabrook Island Club offers many different levels of membership. There are membership opportunities available for purchasers who are purchasing an unimproved lot (vacant land), and a couple of different membership levels for those who are purchasing any improved property (condo, villa, townhome, home, etc.). You can also choose your membership level based on how much you play golf, tennis, whether or not you’ll be renting out your property and other criteria. Q: Will my guests be able to use my membership when visiting Seabrook? A: There are different types of fees associated with what type of guests will be using your membership privileges. There are different rates available for personal guests, rental guests and long term tenants. It’s best to discuss these different types of privileges and rates with the membership office before your guests arrive. Q: Are there food and beverage minimums? A: Yes, there are food and beverage minimums, but that minimum amount is determined by whether or not you are a full-time resident of the 29455 zip code. Q: Is there an initiation fee when joining the club? A: At the time of closing you will be charged a capital fee. The amount of the capital fee is based upon which type of membership you decide to purchase to the Seabrook Island Club. In addition to that capital fee, you will then have monthly membership dues. Each level of membership comes with different types of fees, rates and privileges. Q: When purchasing on Seabrook Island is there a transfer fee? A: When you purchase a home on Seabrook Island there is a contribution to capital within P.U.D. upon the initial sale and resale. This contribution is 1/2 of 1% of the sale price, and is most often paid for by the purchaser of the property (unless negotiated otherwise). Q: Is there a yearly Home Owners Association fee? A: Yes, there is an annual Property Owners Association fee (or homeowners fee) on Seabrook Island. This fee goes towards common area landscaping, the security gate, roads, property owners association pools and amenities, etc. The annual POA fee is just like any other community in the Charleston area where you’re paying to belong to an HOA. Q: Is there a regime fee on Seabrook Island? A: It depends! If you’re looking at a condo/villa, townhome, or even some single family subsections on the island, chances are you will have a regime fee. Some of these are charged quarterly, while others are charged monthly. The regime fee varies depending on which property you are considering, and what the regime fee covers also depends on the property. Some regime fees cover insurances, and only require you to purchase an H06 policy, while others do not. Regime fees can also include things like water, trash pickup, termite bond, exterior maintenance, roofing budget, and so many other things. It’s important to verify what the regime fee covers if you’re looking at properties that have a regime, as well as if there is a separate transfer fee for the regime. Q: What types of amenities are located on Seabrook Island? A: One of the reasons so many people fall in love with Seabrook is the vast range of amenities the island offers its residents. The Beach Club offers stunning views of the ocean, an arcade for kids, and also an outdoor restaurant overlooking the beach (seasonal), and 2 pools. The Lakehouse, also known as the property owners pool, is located near the Equestrian Center and offers a fitness center, indoor lap pool, outdoor pool, and areas for kids to play. The Lakehouse also serves as a “clubhouse” type facility with many different indoor rooms for events and a small lending library. There is another small property owners pool on the island, which has parking for beach access. You can gain access to the beach from several different points on the island. Seabrook Island is also home to 2 golf courses and a beautiful clubhouse facility with stunning views, a restaurant and pro shop. The island also has tennis courts and miles of walking and biking trails. It is important to know that fees, capital fees, and priveleges for the Seabrook Island Club can change at any time. This information is based on the most recent information provided to us by the Seabrook Island Club. We would love to talk with you about Seabrook Island and the Seabrook Island Club, as well as provide you with a full, updated 2019 PDF version of the membership requirements and rates. If you wish to speak with us and obtain further information about Seabrook Island properties for sale and the Seabrook Island Club, please don’t hesitate to contact us. *This information is deemed to be accurate and up-to-date, but cannot be guaranteed by Simply Lowcountry Real Estate LLC. Information is subject to change, and should be verified by you, your real estate agent and a Seabrook Island Club representative. Visitors to Charleston, South Carolina know there is something special that sets the Lowcountry apart from other vacation destinations. Its tranquility and friendliness keeps the Charleston real estate market booming. As buyers flock to Charleston, Simply Lowcountry Real Estate seeks to take that classic Southern hospitality and blend it into a business model. Founders Rob and Laura Street believe in a “boutique experience” for home buyers. To them, the real estate process should be carefully tailored to fit individual clients’ needs. Simply Lowcountry Real Estate is built on a high quality, concierge model. Laura, a College of Charleston graduate and Mount Pleasant resident, knows the Lowcountry and built her business from the ground up. As broker-in-charge, Laura demonstrates the worth of local knowledge and instills the importance of cultivating lasting relationships with clients. Laura’s values and hard work were reflected in her 2018 achievements. She closed out 2018 ranking in the top 7% of real estate agents in the Charleston Trident Association of Realtors MLS. In doing so, Laura has showed hundreds of local agents that the boutique experience is the future of real estate. Simply Lowcountry Real Estate has quadruped its business from 2017, expanded its network nationally, and is excited to add new agents this year to meet demand. Taking the plunge into small business ownership is not an easy feat, but Laura's dedication and commitment to proving top notch hospitality to her clients has paid off. 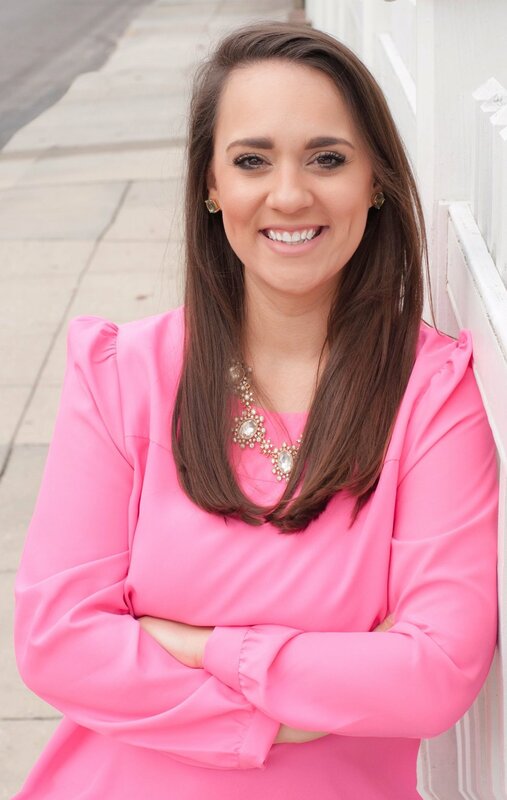 At only 29 years old, Laura is incredibly honored to join the prestigious East Cooper Top Producers Club in 2019, placing her among top realtors in the Lowcountry. Laura, Rob, and their dog Maggie are proud to call the South Carolina Lowcountry their home and as their business grows they hope to share the unique charm and beauty of Charleston with you. Simply Lowcountry Real Estate is a member of the Charleston Trident Association of Realtors, and their agents are part of the National Association of Realtors. You can reach Simply Lowcountry Real Estate at (843) 790-6272 or hello@simplylowcountryrealestate.com, or visit them on the web at simplylowcountryrealstate.com. 2018 is off to a good start for Simply Lowcountry Real Estate! Our brokerage had it's 1 year anniversary last month, we hosted our Annual Client Appreciation Dinner for all of our past clients and we have grown our team to 6 agents. 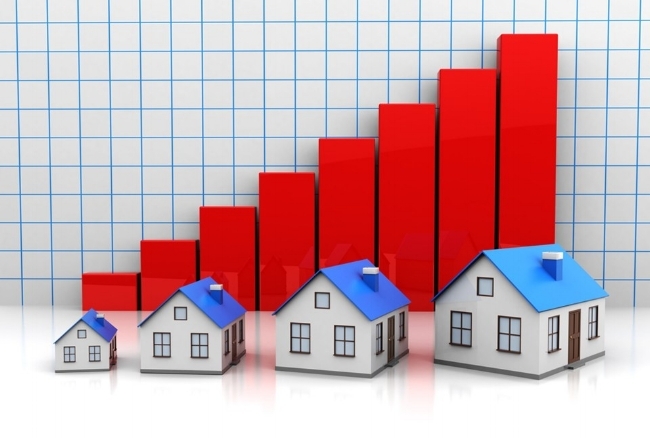 We also see the market picking up in anticipation of the Spring real estate season- we have several new listings coming on the market in the next few weeks and we have buyers under contract who are excited to close on their new homes. Just as past years, we had the opportunity to attend the 2017 Year in Review Market Update hosted by the Charleston Trident Association of Realtors. The event sold out within days this year, with over 700+ Realtors registering and attending. The Market Review was led by economists Dr. Joseph von Nessen with the USC Moore School of Business and Stephen Slifer with Numbernomics. Slifer spoke most about the national economy and outlook, while Von Nessen focused more on the South Carolina and Charleston area economies. Since this tends to be one of our most read blog posts of the year, we thought we would share a brief summary and the major takeaways from what Stephen Slifer and Joseph Von Nessen shared in their presentations at the event. Then, we will dive deeper into the Charleston market sharing charts, graphs and statistics on what is happening here locally. Consumer confidence is at its highest point since the early 2000's, with an 8% increase in net worth and 170,000 new jobs each month. Home sales are the fastest in a decade, there is 3.2 months of supply (nationally) and the average days on market is 40 days, with half of homes selling in 30 days. Small business confidence is at its highest since 2004. Predict a 2.9% GDP growth in 2018, it was 2.7% for 2017. 4.1% unemployment growth. Hourly earrings have increased 2.7%, and there was a 3.5% compensation growth. If the economic trends continue, in June of 2019 we will hit the longest expansion of growth on record. Predicted 30 year mortgage rate is 4.5% for 2018. Charleston employment growth is stabilizing, as well as hourly earnings. The MLS activity shows the most growth in the $400k + listing categories. Distressed Properties are fewer and far between from their peak during the recession. In 2017, the percentage of closed properties that were either a short sale or foreclosure decreased by 8.1%, making it a total of 5.7% percent of the market. There is lots of new construction in the Charleston market. There are tons of new neighborhoods popping up, however there are only 3.8 months of finished product on the market. New construction supply has seen less change however than resale home product. In 2017 there were a total of 18,381 sales, a 3.1% increase from 2016's 17,826 closed sales. The top 5 areas of change in closed sales from 2016 were: Seabrook Island, Edisto area, Isle of Palms, Johns Island, and Kiawah Island. The bottom 5 areas with a change in closed sales from 2016 to 2017 were West Ashley area, Sullivan's Island, Upper Mount Pleasant, Upper Charleston Peninsula and Hanahan. Inventory has been a constant issue in the Charleston area, and also a national issue. The inventory continues to decline month over month. At the end of 2017 there were 4,673 homes for sale. This number is down 14% from 2016's year end number of 5,431 homes for sale at the end of 2016. The top area for change in inventory was the Wando/Cainhoy area which is up 53%, and the bottom area for inventory change was the Edisto Area which is down 25.8%. The average sales price for 2016 was $320,703, that was up 4.3% over 2016. The average sales price for 2017 in the Charleston Tri-County area is $340,183, up 6.1% over 2016's average sales price. Since 2013, this number has increased each year. The top 5 areas for change in the average sales price were Kiawah Island, Sullivan's Island, Upper Charleston Peninsula, James Island and the Edisto area. The bottom 5 areas for change in average sales price from 2016 were Hollywood/Ravenel/Meggett, Wando/Cainhoy, Lower Mount Pleasant, Daniel Island and Isle of Palms. The average number of days on market (DOM) for 2017 was 55 days, a decrease of 5.2% from 2016 where the average number of DOM was 58. The percentage of original list price received on listings in the Charleston tri-county area stayed the same from 2016 to 2017. The percent of original list price in which a listing received was 96.5% for two years in a row. The number changed from 2015 to 2016 however by .6% when it went from 95.9% (2015) to 96.5% (2016 and 2017). The top areas for change in percentage of original list price received from 2016 were Seabrook Island, Edisto area, Isle of Palms, Sullivan's Island and Wando/Cainhoy. The bottom 5 areas were Lower Mount Pleasant, Downtown Charleston, Kiawah, Upper Mount Pleasant and Daniel Island. We touched briefly on distressed property sales at the top of this 2017 Market Review. In 2013, 18% of sales were distress sales, and now in 2017 only 5.7% of sales are distress sales (short sales and foreclosures). To compare 2016 to 2017, 2016 saw 6.2% of sales as distress sales, which means from 2016 to 2017 there was a 8.1% decrease in distress sales. The top 5 areas with distressed market share in 2017 were: Folly Beach, Hollywood/Ravenel/Meggett, James Island, Greater Summerville and Greater North Charleston. **PLEASE NOTE: A property is counted as Distressed when the SPECIAL field in CTARMLS is marked as "Lender Owned," "Corp Owned" or "Possible Short Sale,", or if the POTENTIAL SHORT SALE field is marked "yes," or if the REMARKS or AGENT NOTES fields contain a phrase that 10k Research has determined will very likely mark a distressed property. We also touched briefly on new construction at the top of this report, but wanted to note the top areas for new construction market share in 2017 in the Charleston Tri-County area. The percentage of original list price received for new construction in 2017 was 100.1%. The peak of new construction inventory was in April of 2017 and at years end of 2017 there was a total of 3.8 months of new construction inventory supply, compared to 2.8 months of previously owned inventory. The top areas for New Construction Market Share in 2017 were Johns Island, Goose Creek/Moncks Corners, Hollywood/Ravenel/Meggett, Upper Mount Pleasant and the Dorchester Road Corridor. We aren’t going to break down each MLS area separately, however we did want to note the number of closed sales in Charleston, Dorchester and Berkley County’s. Charleston County had a total of 9,438 closed sales, up 2.1% from 2016. The median price in Charleston County was $251,333, a 4.7% change from 2016. 18.5% were new construction, 24.6% were condo/townhouse sales, and 95.9% was average percentage of original list price received, with 59 DOM average. Berkley County had 4,817 closed sales, up 7.8% from 2016. The median price in Berkley County was $220,115, up 4.8% from 2016. 31.2% were new construction sales, 18.5% were townhouse/condo sales and 96.5% was the percentage of original list price received, with 46 DOM average. Dorchester County saw 3,473 closed sales, up 1% from 2016. The median sales price was $215,000, up 7% from 2016. 20.4% were new construction sales and 10.9% were condo/townhouse sales. 97.6% was the average of percentage of original list price received, and 45 DOM average. The highest number of sales were recorded in the Goose Creek/ Moncks Corner area with a total of 3,388 sales, a 9.7% increase from 2016. The second highest amount of sales were recorded in the Greater Summerville area. There were 2,225 closed sales, a .9% increase from 2016. The third highest number of recorded sales was the West Ashley area with 1,874 sales, however this is a 2.2% decrease from 2016. Sullivan's Island had the least amount of recorded sales this year with 59 homes sold. That is a 4.8% decrease over 2016. It's important to note that Sullivan's Island is a much smaller area than say the Goose Creek/Moncks Corner, the area with the highest number of sales in 2017. Sullivan's Island also does not offer new construction neighborhoods (in the traditional sense). The median sales price in this area was $1,700,000, a 25.9% increase from 2016. The area with the second lowest number of closed sales was Kiawah Island, with a total of 65 MLS sales. This number is up 14% though over 2016. The median sales price for this area was $725,000, a 17.9% increase over 2016. The third area with the lowest number of closed sales is St. George and the Rural Dorchester County area with 71 sales, up 18.3% over 2016. The median sales price for this area was $127,500, a 1.4% increase from 2016. We expect that we will still see a strong sellers market because of the inventory shortage, not just locally, but nationally as well. As for buyers, the market will still be competitive, so it's important to start putting plans into action if your goal is to buy a home in 2018. We do expect to see prices rising at a slower trend though.